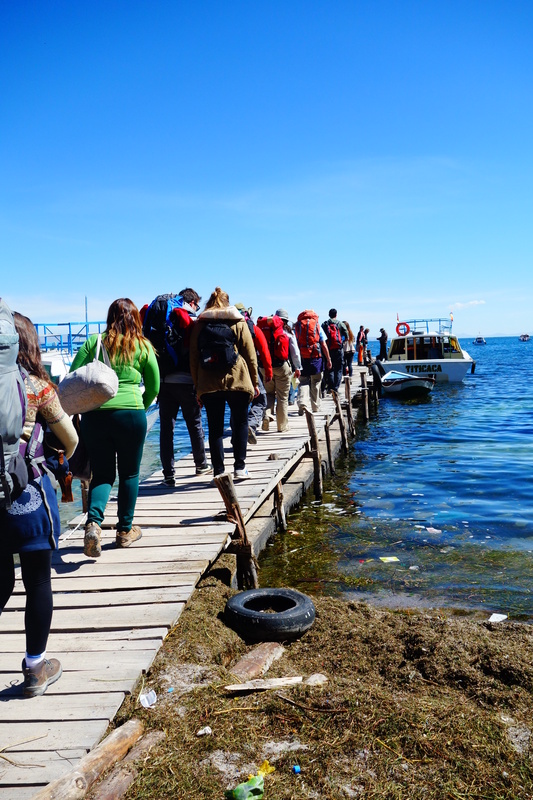 We left La Paz at 8am on a coach heading towards Lake Titicaca. By chance, Joanna was wearing her school hoodie with the emblem on show. 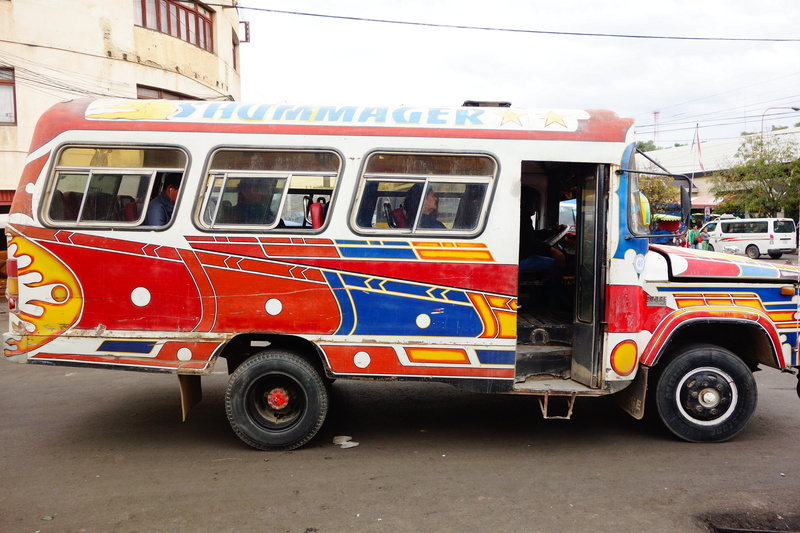 As the people were getting on the bus, one man stopped abruptly and said ‘I went to that school.’ What are the chances that on a tiny Bolivian bus heading to Lake Titicaca we would bump into a former student from our school. Our bus ride was very short and soon we arrived into a lake front town called Copacabana. 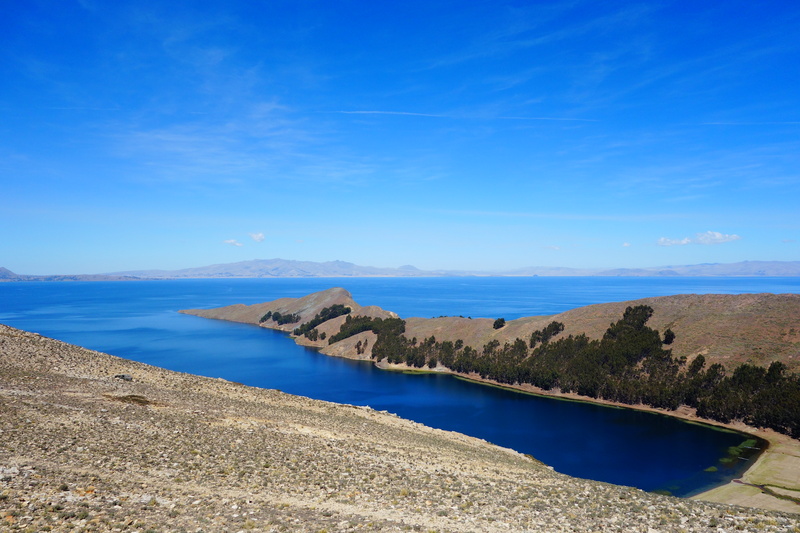 We had a quick lunch and took a 2 hour ferry to Isla del Sol – a stunning island with no running water and just enough electricity to power a small bulb for a few minutes. We were at 3800m and what we didn’t realise was that our hostel was at the top of the hill. Climbing with around 15kg on your back at this height is extremely difficult. After about 20 minutes, we arrived, completely out of breath. We checked in and an hour later walked along the island to its eastern point to watch the sunset which was beautiful. This island is magical. A gem in the middle of a lake standing at 3800m above sea level. Truly amazing. 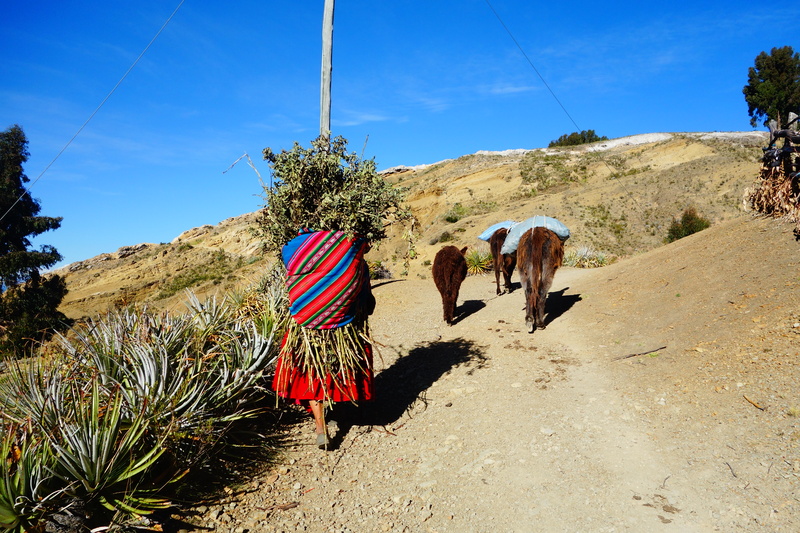 There are few inhabitants on Isla del sol, those that live here are either farmers with their many donkeys and alpaca or the Cholitas (traditional Bolivian women) who run the hostels. After the sunset we walked up to a restaurant which is reputed to be the best on the island. It turned out to be one of the best restaurants I’ve ever been to. It lies at 4010m (definitely the highest restaurant I’ve been to) with a spectacular view over the island and lake. The tiny, hilltop restaurant, which is lit purely by candlelight is run by one man. He is the chef, the waiter and the barman. Due to this, the food does take a bit longer than normal however the food is just phenomenal; worth every minute waiting. We met some fellow backpackers on the island and there were 12 of us at dinner. Australians, Swiss, British, French and more (a very multinational table). Finding little places like this is what travelling is all about! We have been at high altitudes now for a while and so sleeping around 4000m is no problem. We had a continental breakfast (which sounds far more luxurious than it was) and then I set off for an all day trek around the entire island with a French couple who I had met in the hostel. Dan and Joanna stayed around the South island for the day. The trek was brilliant – the perfect way to appreciate the island’s beauty and history. We walked for 3 hours along the hilltops overlooking both sides of the island before finally arriving at the northern tip for lunch. We rested for an hour before setting off again on our return journey hoping to make it back to the south before dark. We arrived into the village at 6pm just in time for sunset after what had been a super day. We walked up to our hostel and to our surprise the door was locked with Joanna and dan waiting outside. We continuously knocked on the door and searched for open windows before finding the owners bedroom door unlocked. So, (like in a film) we cautiously tip toed through her room and unlocked the door from the inside. 10 minutes later she returned and we let her in. We acted like nothing had happened and were completely oblivious to the law we had just broken. The poor old lady was completely confused and bewildered and couldn’t figure out how we had entered. The French couple eventually told her that we had broken in to her hostel! She was not amused. Dinner was a no-brainer, the best restaurant in Bolivia and probably South America – las velas. We all had wild trout fresh from the lake which was superb. 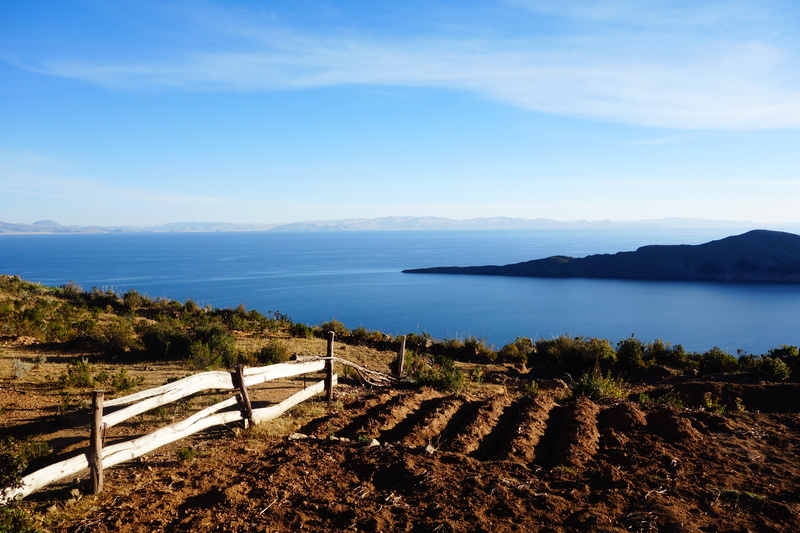 The perfect way to end a perfect stay on Lake Titicaca. We left Isla del sol on the slowest ferry imaginable and had a nice lunch on a rooftop restaurant on the mainland. 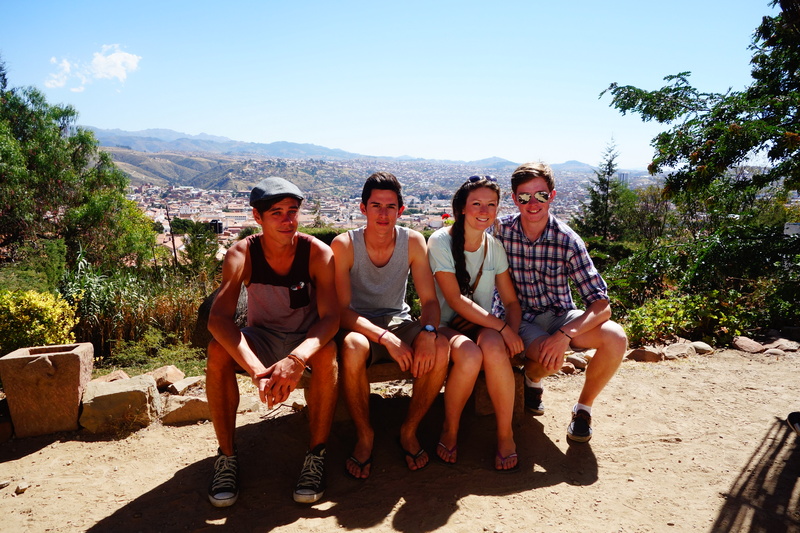 We left Bolivia in the evening on an overnight bus and arrived in Cusco, Peru in the morning! My final country of the trip. 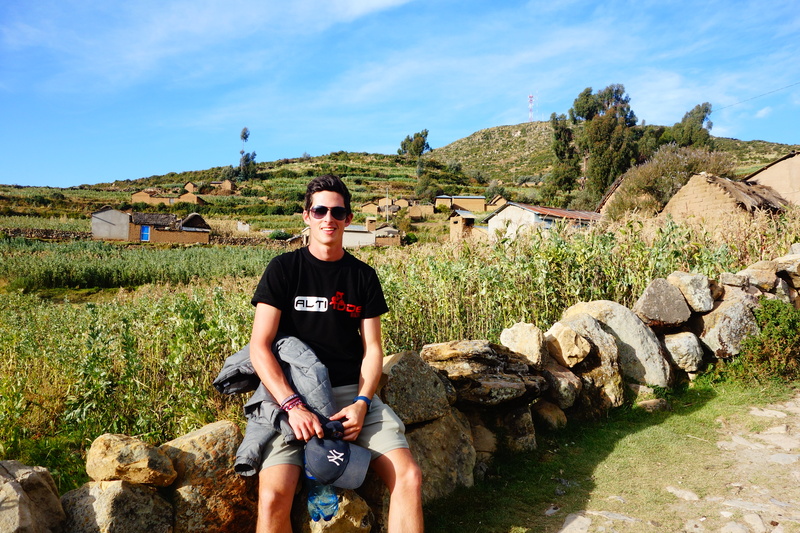 Cusco is the gateway to Machu Picchu which we will climb in less than a weeks time. Very exciting! Sadly, we departed our hotel and took a 9 hour bus to la Paz which was extremely dull. We arrived around 8pm and fortunately managed to book death road for the following day. This is something Dan and I have been looking forward to most in South America. 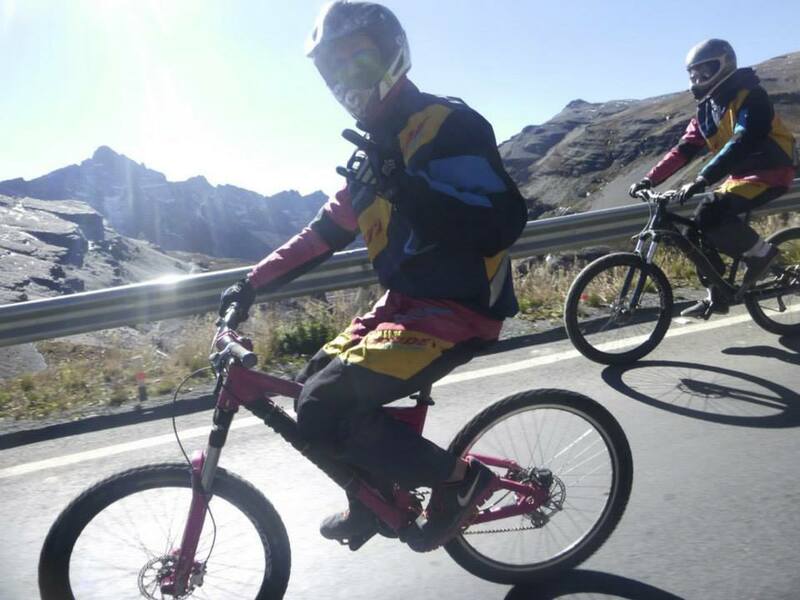 We awoke at 6:30am and were picked up by minibus which drove us one hour up the mountains to 4700m. It is the start of the winter season now and so it is starting to get rather cold; there was even a tiny bit of snow on the mountain. This was the beginning of an all day ride that would leave us at 1200m in a hotel with a buffet lunch awaiting. 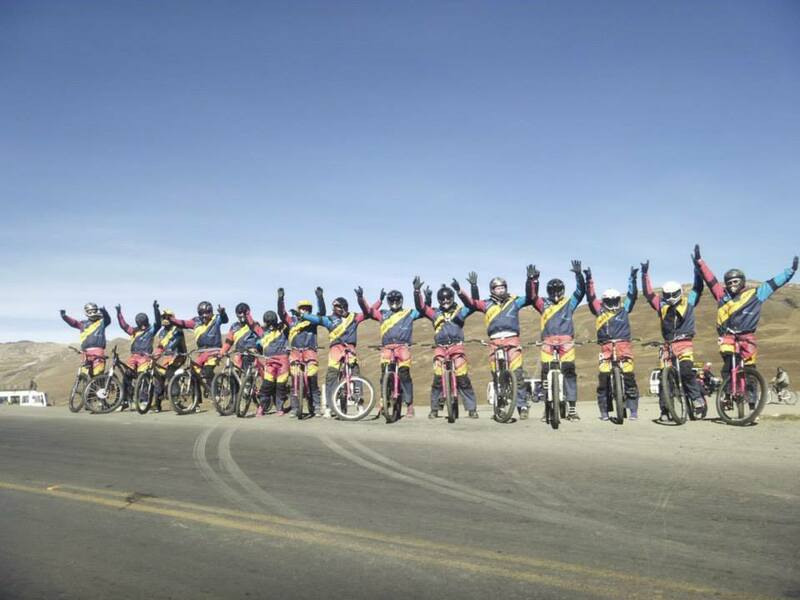 We were given full body suits, helmets, knee and elbow pads, gloves and a bike with questionable brakes. After a short brief we set off on the tarmac part of death road. This was brilliant as we reached speeds of up to 60kph although it was far too safe for our liking. After about half an hour, we arrived at the ‘real’ death road. 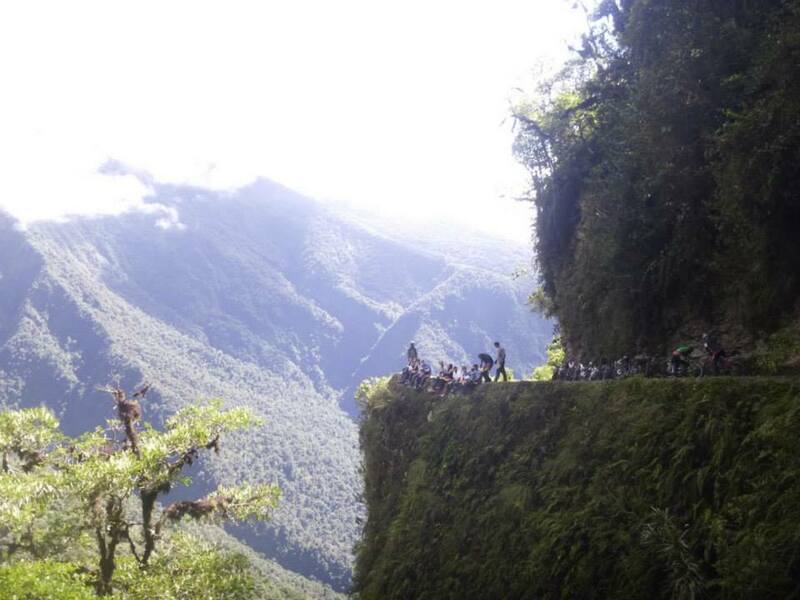 Death road is a gravel path that has been carved out of the cliff side which is now used mostly for cyclists. There are occasional cars and even lorries that drive down this meandering road which descends around 36km! In recent years, the road was used more regularly by public buses and the road is only wide enough for one vehicle so many buses used to crash into one another and fall off the edge. In the past, there have also been around 16 cyclists who have disappeared. Luckily we were all fine! We started riding quite slowly with all this information fresh in our minds. But regardless, the ride was absolutely fantastic! 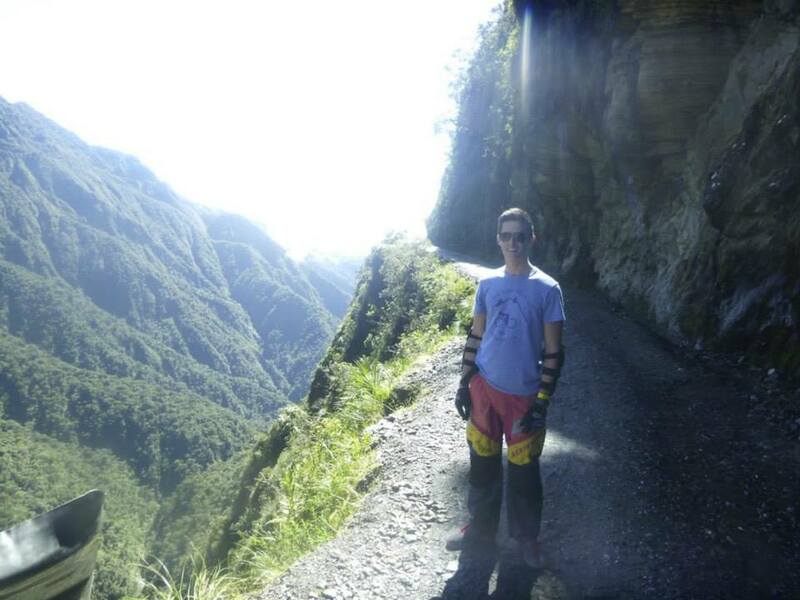 The scenery was spectacular and for a few hours we rode down the infamous death road with no problems whatsoever. Dan did fall off twice, once colliding with a stationary bus, but Joanna and I were fine. In our group, one man hit a protruding rock and flew over his handlebars. Also, in another group who were just behind, three cyclists were hospitalised. The infamous death road failed to disappoint. We ended the ride at a hotel where there were showers (cold unfortunately) and a buffet lunch. We rested for a couple of hours before getting a 3 hour minibus back to la Paz. There were three like-minded Australians guys in our van who were all 19 and for the 3 hours, we were all in hysterics. The Ozzys were hilarious; three hours flew by. Such a brilliant day! After the most uncomfortable, cramped overnight bus we arrived in Cochabamba. 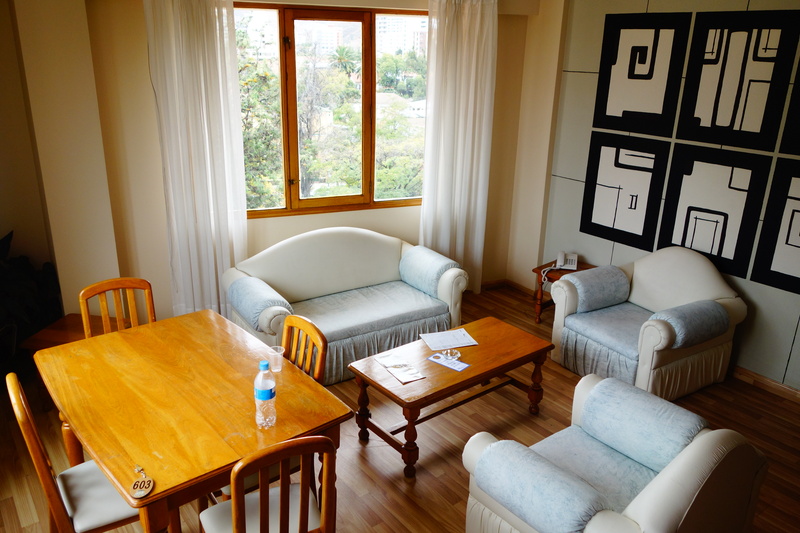 Accommodation in Bolivia is cheap and so we decided to splash out and relax for two nights in a hotel rather than a hostel. We took a taxi to our 4-star hotel (at 5:15 – luckily reception was 24hrs) and our room was UNBELIEVABLE. We had two floors of luxury and all for £13 a night! Unfortunately however, we will soon have to return to hostel life, as this luxury living is not sustainable for backpackers. We had a quick nap and later feasted on the buffet breakfast which was great (for Bolivian standards). 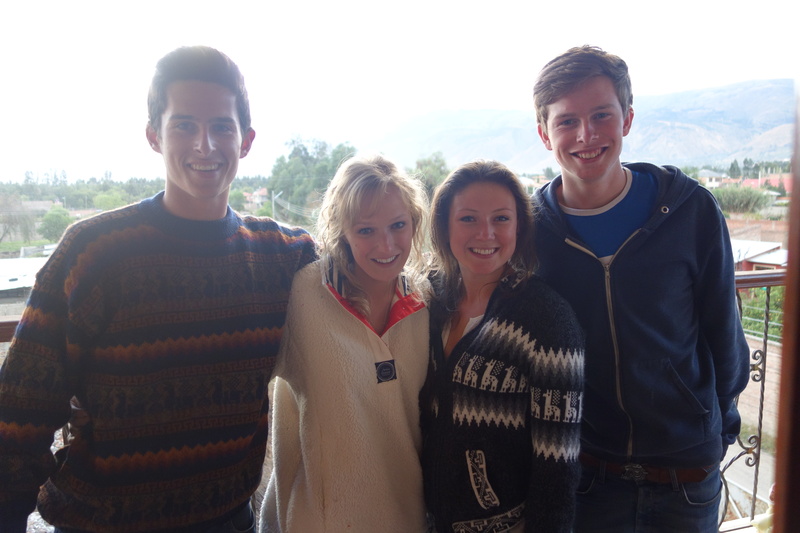 In the afternoon, we went to visit Joanna’s cousin Katie who is doing charity work here in Cochabamba. It was great to see her and I think Joanna really appreciated having a girl to talk to. We went out for dinner and after they planned on going to a local church with the charity group. I have been to the church twice in my life and am not religious at all, so was very hesitant when this was mentioned. 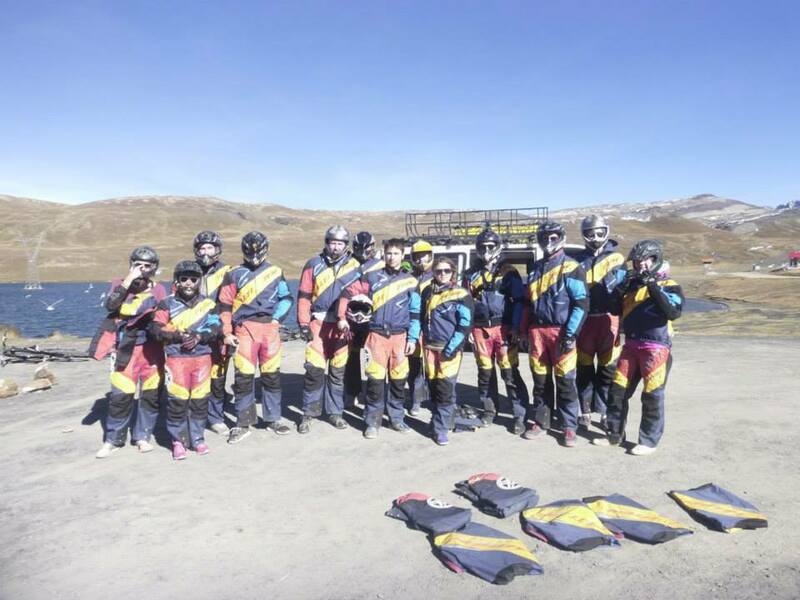 They all went, and so instead of risking my life alone in a Bolivian taxi, I decided to come along. It was only 45 minutes and therefore bearable but I will not be returning to the church in the near future. My views seem to clash with that of the church. 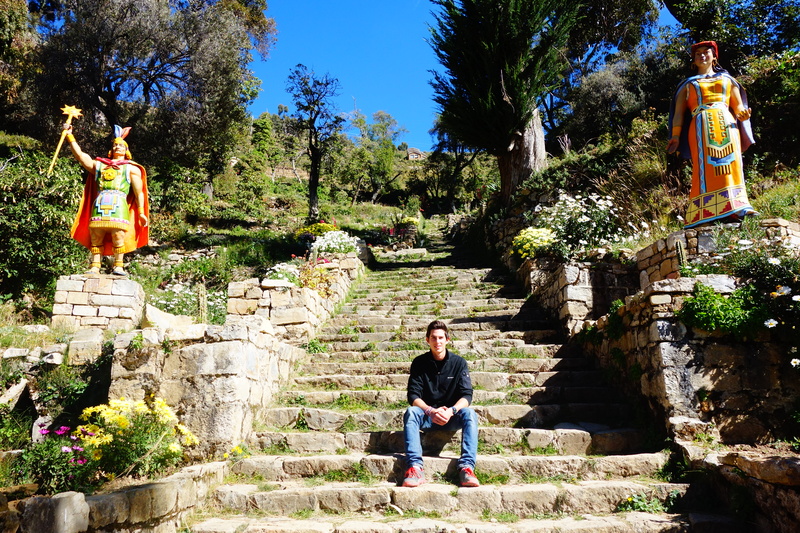 It was an experience nonetheless and I definitely did not expect to be going to the church in Central Bolivia. We returned to our hotel and slept like kings. Another buffet breakfast was the perfect start to the day. We returned to our rooms and heard what sounded like gunshots getting closer and closer. We looked out of our window and there was a huge riot going on. The university students were protesting as there is a lack of state funding towards education. It was crazy! For more than an hour the police and students clashed. The ruthless Bolivian police were firing tear gas whilst the students overturned and burned the bins and set up blockades around the block. It was quite scary to watch; even from the safety of our hotel. The riots were later on national news and they looked even crazier than what we had seen. 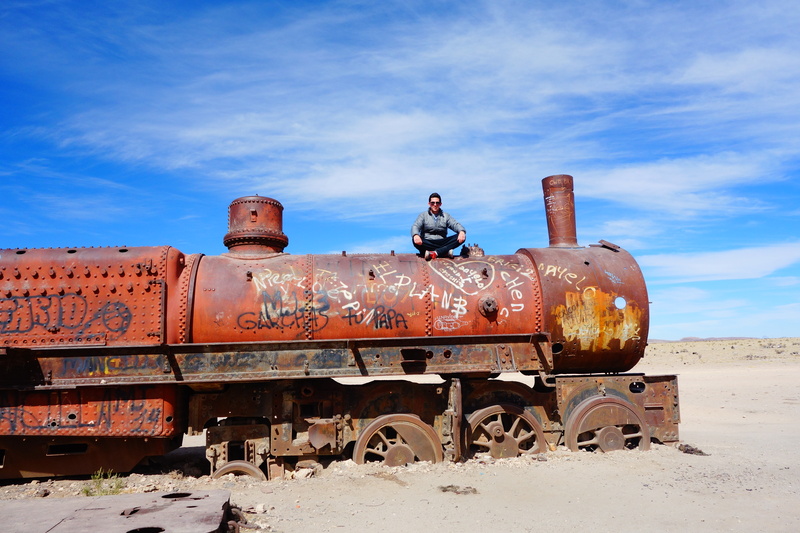 A real Bolivian experience. Around noon (after the riots had abated) we walked to ‘La Cancha’ which is an area hosting the biggest market in South America – a hotspot for pickpockets. The market was enormous and after 5 minutes we were lost in its labyrinth. There are hundreds and hundreds of stalls that sell absolutely anything. We spent most of our time in the artesian market buying souvenirs and Bolivian memorabilia which were all so cheap. In the evening, we went to meet Katie and her Brazilian friends for ice skating. 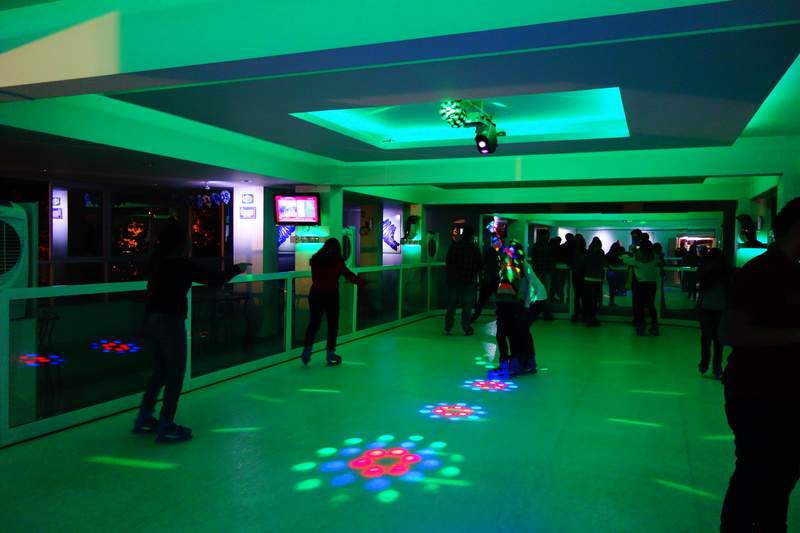 The ice rink was not what we were expecting. It was not made of real ice but synthetic ice otherwise known as plastic. I never knew you could ice skate on plastic. It was very different but great fun. We went out for a nice Mexican dinner after and said goodbye to Katie. We head to La Paz tomorrow; the nation’s capital. Today, we did not strain ourselves much. We had a wonderful lie in and around 12 o clock walked up the hill to one of the best restaurants I’ve ever been too. It boasts views over the whole city and serves the best food. People should come to Bolivia just to eat at this restaurant! Feeling rather full for a measly £4 (expensive in Bolivia) we strolled down the hill and inadvertently stumbled across a French creperie. 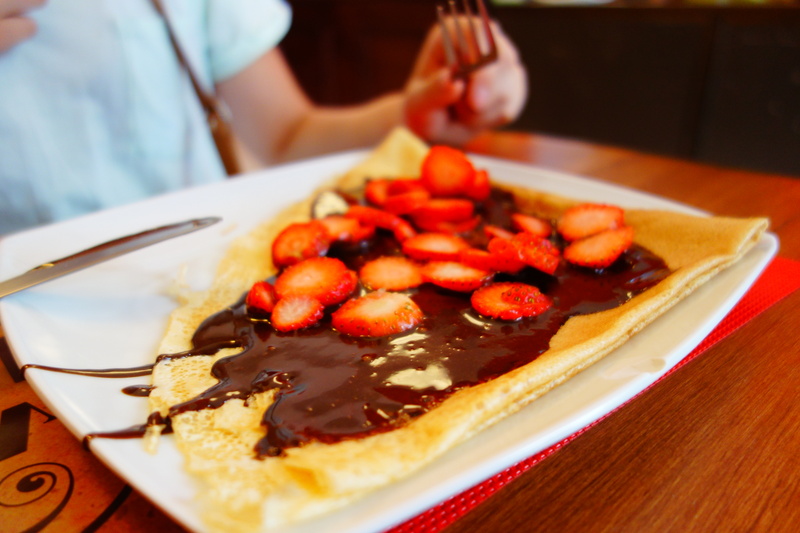 We caught a glimpse of the Nutella pot and temptation overcame us – we had to have a crepe. As you can imagine, they tasted unbelievable. Just what we needed on a hot Bolivian day. 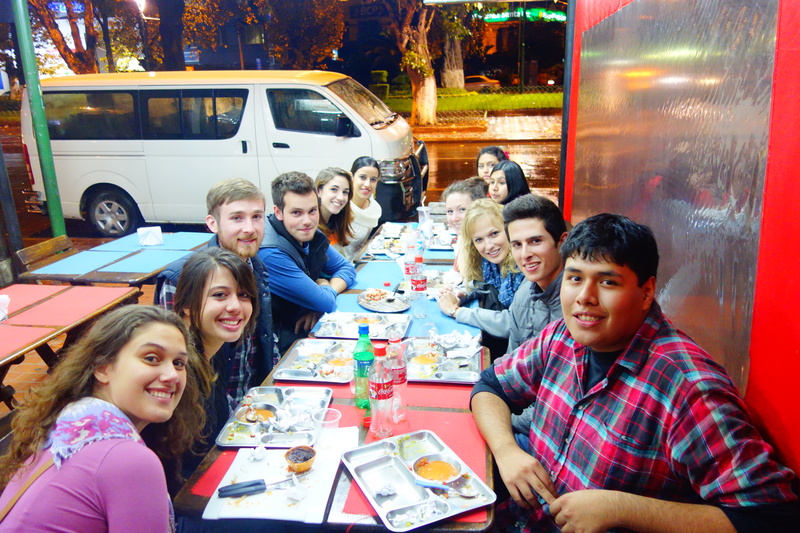 We relaxed in our hostel In the afternoon and managed to build up the energy to go out for dinner. A rather tough day for us fancy backpackers. The following day was far more eventful. 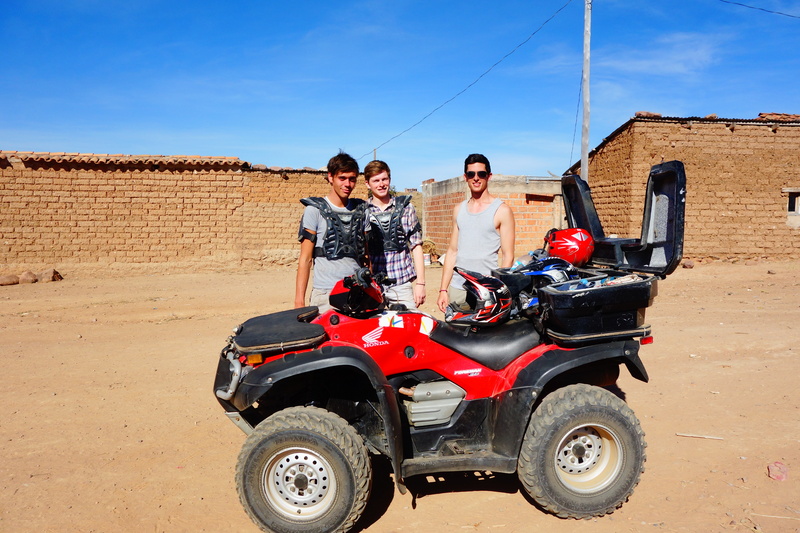 We lumbered out of the hostel at 12 o clock and booked quad biking for the afternoon!! I couldn’t have been more excited. 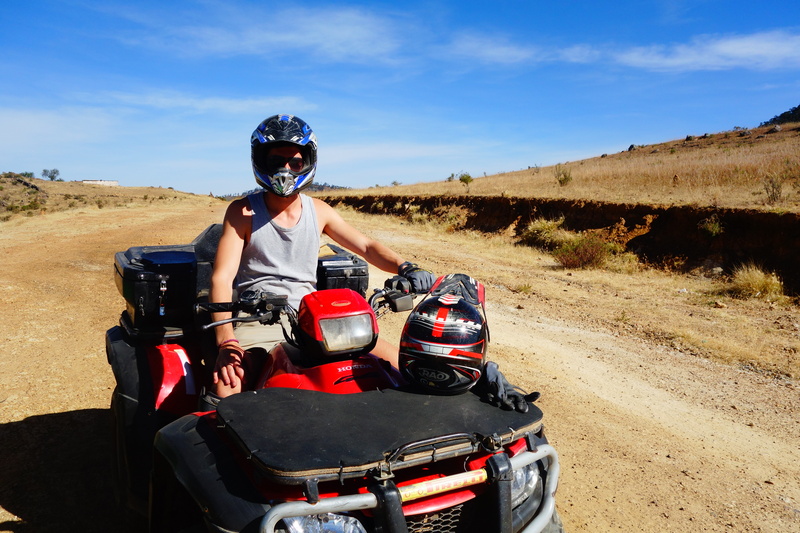 I absolutely love quad biking. After going out for lunch (which cost £1.20) we were driven to the outskirts of the city and kitted up for our afternoon ride. Max and I went on one, dan and Joanna on the other. 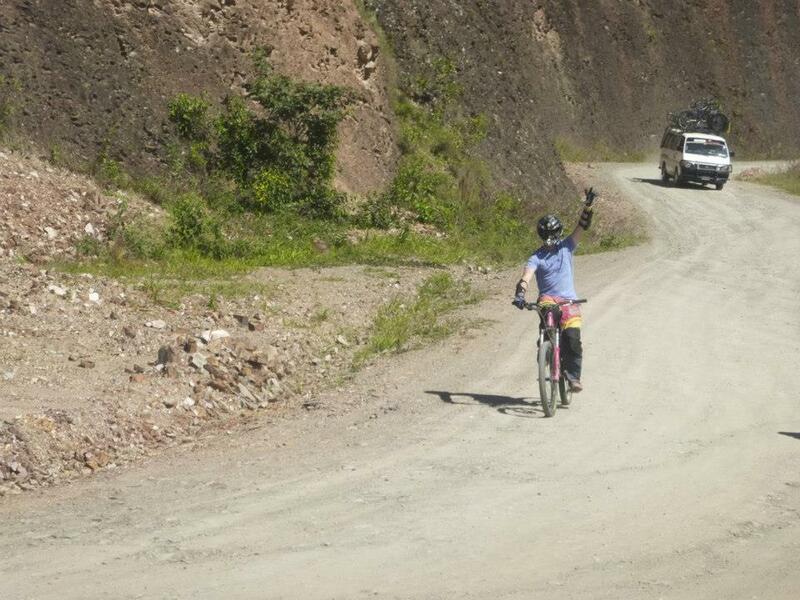 We drove for around 3 hours up and down the dusty hills of Sucre which was just brilliant. I was in heaven. We all loved it and it was definitely one of the best days we’ve had in South America so far. We returned (covered with dust) to Sucre and decided to go to my favourite restaurant before catching our bus to Cochabamba. A 10 hour bus on the awful Bolivian roads is not something we are looking forward too. We were picked up from our hostel early in the morning and driven to the Chilean border. There was only one man in the border office and it took us 2 and a half hours to cross. Such a pain. 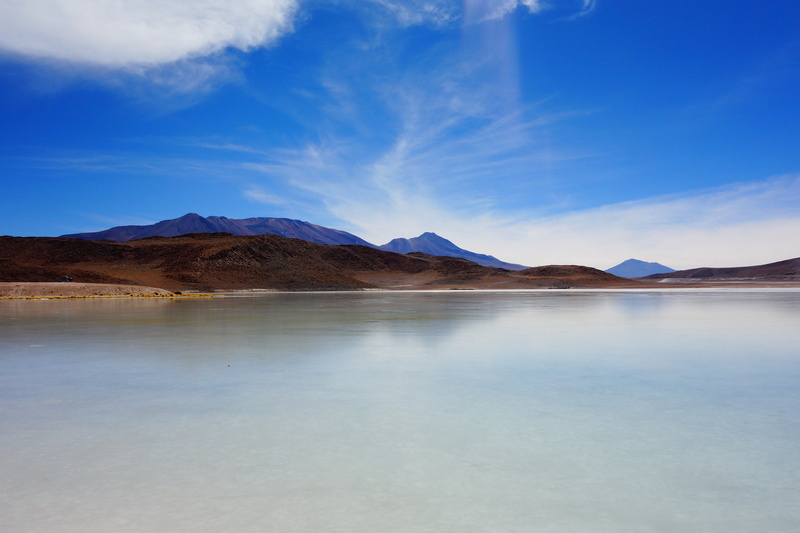 We drove further into the desert to the Bolivian immigration office at 4400m and then onwards to ‘Laguna blanca’ and ‘Laguna Verde’, both of which were breathtaking. We also stopped at thermal springs and geysers which are formed by the near volcano. The scenery all around is just incredible. It is amazing to think places like this exist in this world. We drove up to a maximum of 4900m. At this height, the air is thin and it is difficult to breathe. We chewed our coca leaves and I’m not entirely sure if they had any effect but we chewed nonetheless. We arrived at our refuge (which really was in the middle of nowhere at 4200m) and were shown to our 6 bed dorm which was actually not too bad. Satisfactory for one night only. We met a very nice Australian couple in the minivan and so all decided to go in the 4 wheel drive together which was great fun. We were also in the dorm with them. 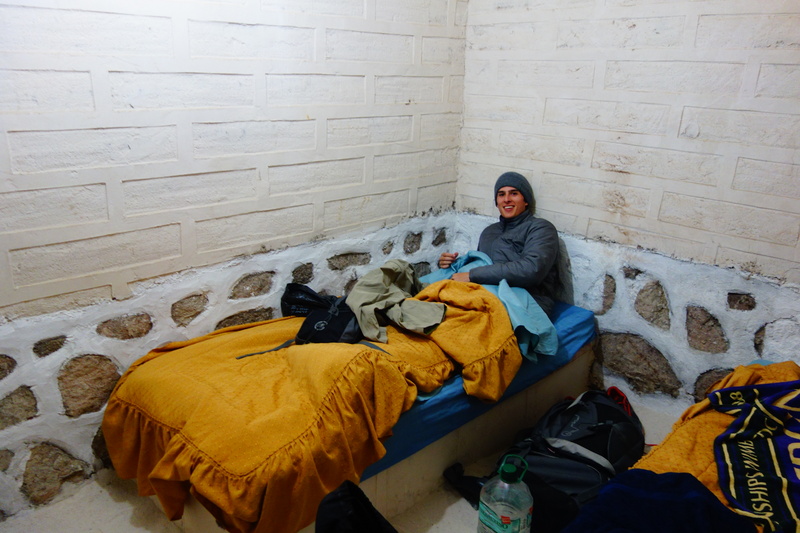 After a really good spaghetti bolognese at 4200m we went back to our dorm which was absolutely freezing. We all put on as many layers as possible and braced ourselves for a night of sub-zero temperatures. Last night was one of the worst nights sleep I’ve ever had. Sleeping at 4200m is no easy feat. Imagine trying to sleep while having a beating headache and struggling for breath. All of us suffered badly apart from the two Australians who slept so peacefully on their concrete bedding throughout the night. We were all very bitter the following morning. 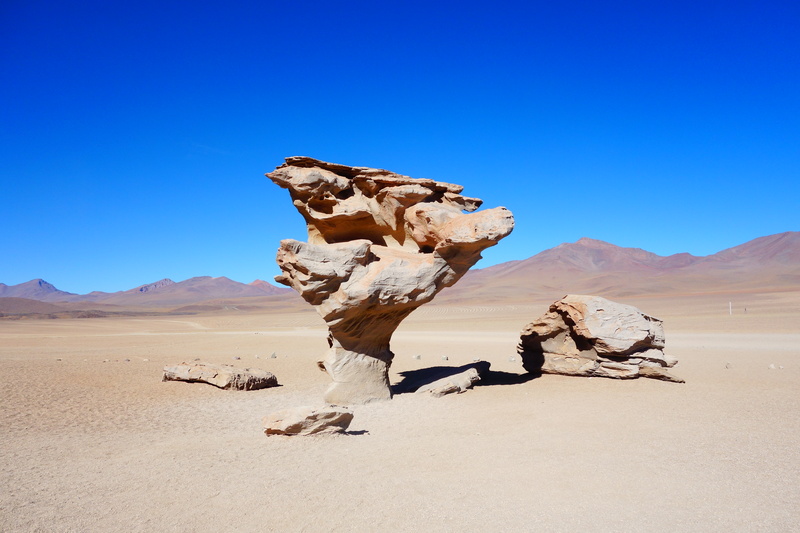 The incredible thing about the Bolivian desert is the contrasting temperatures during the day and night. In the day the sun beats down on the arid land heating it up to extremely high temperatures and in the night the temperature plummets below -25 degrees celsius. This area is not somewhere I would like to live. Kilometres upon kilometres of open desert without the slightest intimation of life. 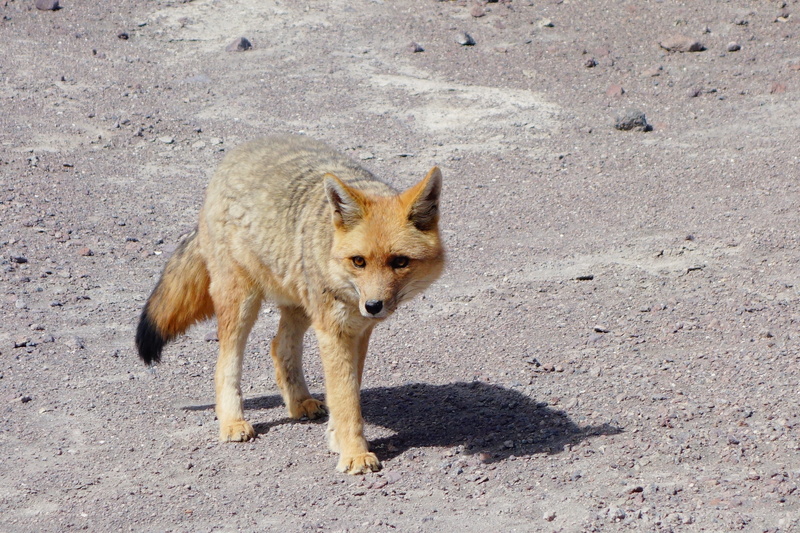 The only animal that roams this land is the llama (and occasionally there are sightings of the fox). 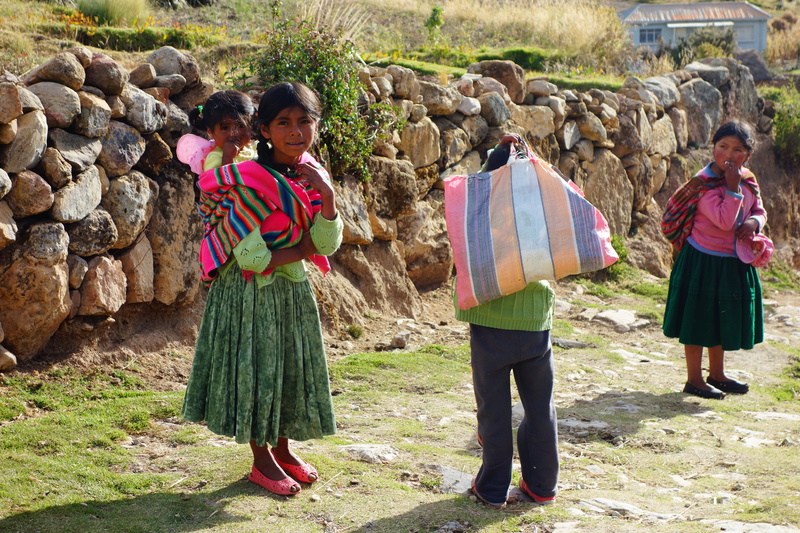 Sustainable life here in depths of the Bolivian desert is hard to come by. We left the refuge as soon as possible and were all very keen to descend to a lower height. In England, our highest peak is below 1000m and few Brits would consider sleeping at that height let alone 4200m. We were definitely out of our comfort zone. In the morning we visited three lagoons which were spectacular although they all looked identical. After our third lagoon, we were ready for a different sight. We had a very good lunch and then drove to a nearby volcano. 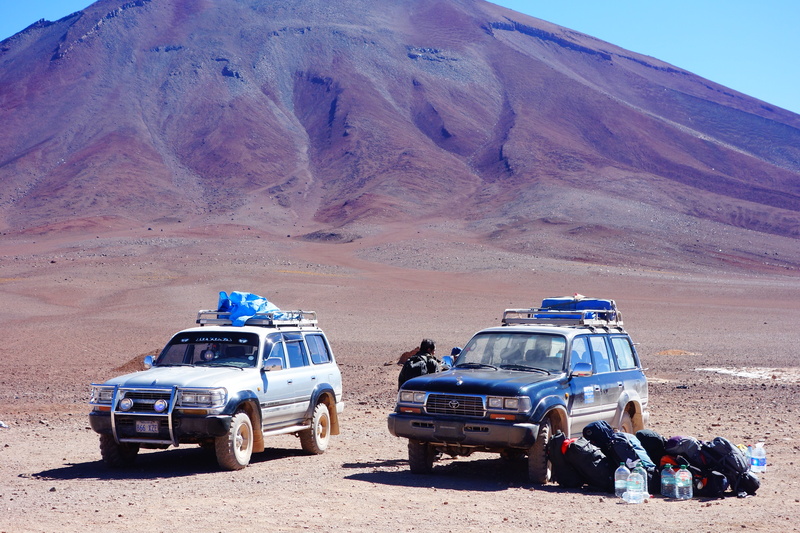 Annoyingly when we arrived at the volcano, our partner jeep was nowhere to be seen. Their car had broken down. We waited in the dry, waterless desert hoping to reunite with our friends who eventually arrived. We ended our day at a refuge which was made entirely out of salt. Salt chairs, tables, beds, salt everything. It was very cool although extremely basic. The night was unbearably cold again but the altitude was not a problem. We were staying at 3700m and it’s amazing how much of a difference 500m can make. Today was our last and best day of the trip. We awoke at 4 30 so we could watch the sunrise on the salt flats. We drove for around one hour and parked our jeep right in front of the rising sun. It was beautiful, although all of us suffered from mild frostbite. For the rest of the morning we drove around the salt flats and took the standard tourist photos. The photos really do not do the salt flats justice. The environment and terrain is like nothing else in this world! The salt flats span across 12 000 sq kilometres and only change one metre in elevation. Truly mind-boggling. 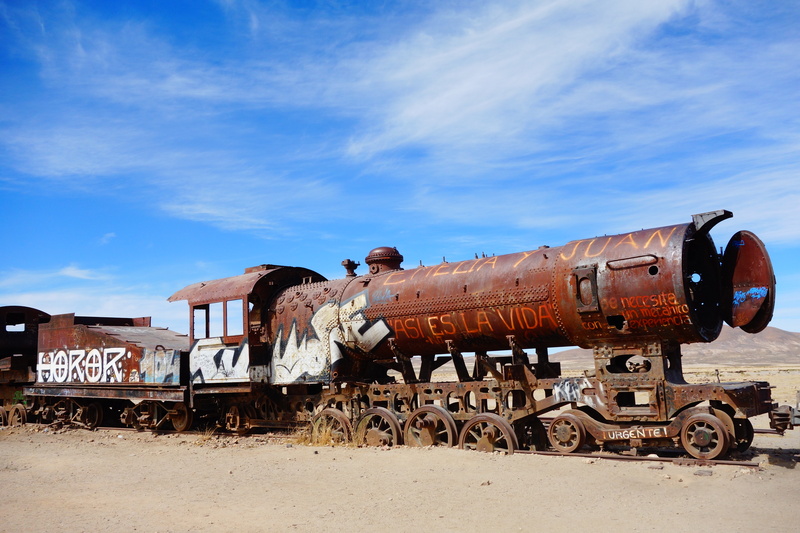 We also visited a train cemetery which was quite bizarre but very cool at the same time. 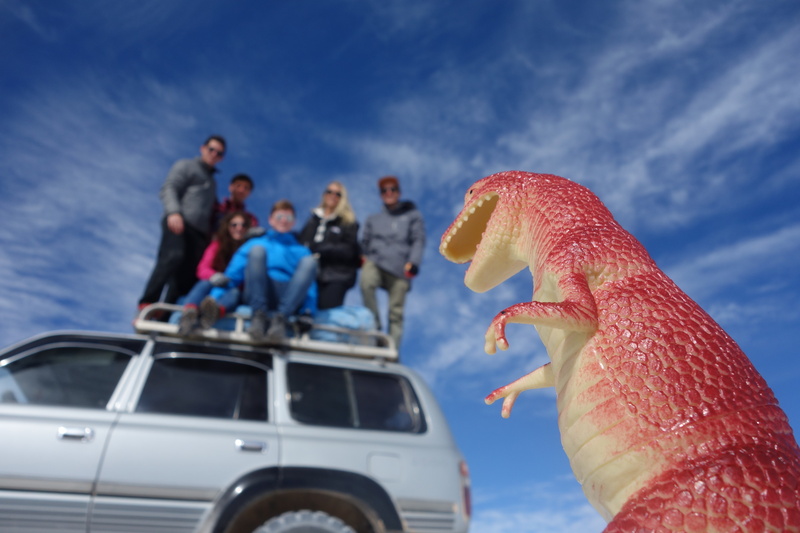 After 3 days in the jeep, we finally arrived in Uyuni – the gateway to the rest of Bolivia. We were expecting concrete roads and some sort of town however as soon as we had the town in our sights, we knew we were severely mistaken. 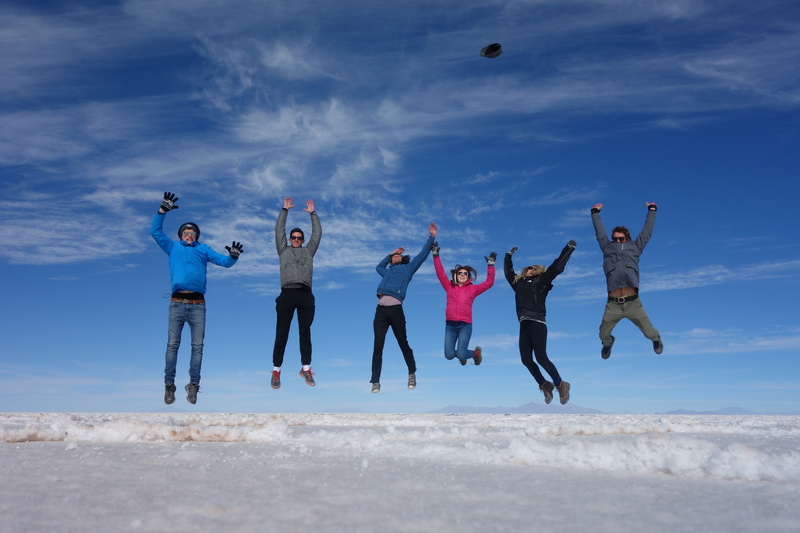 Uyuni was horrible! The town is rubble – old, dusty bungalows line the scorching unsurfaced streets. There is absolutely nothing to do in this desert town. Our intention was to stay here for one night before heading further into Central Bolivia however we left as soon as we could. 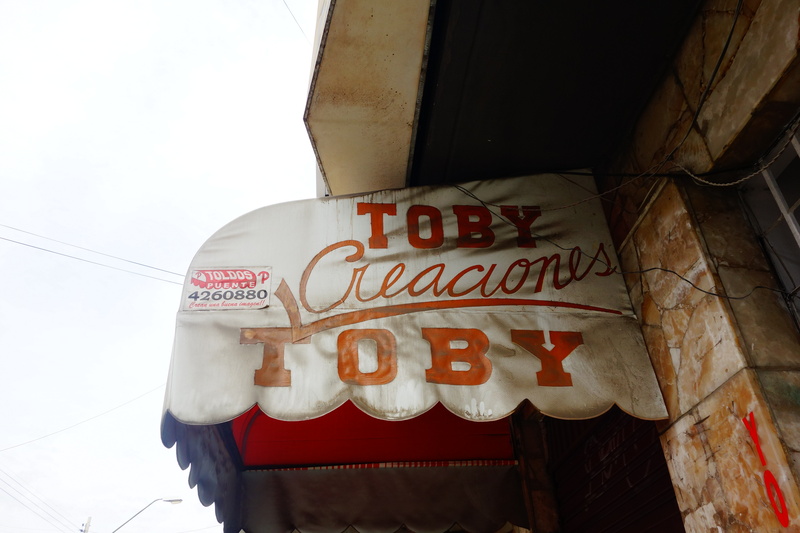 We got in a taxi and drove 3 hours to Potosi. 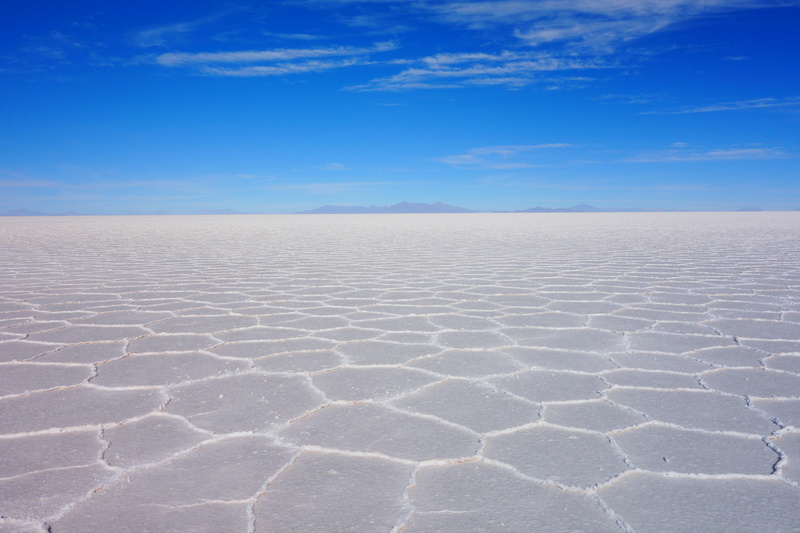 Bolivia is one of the most dangerous countries in South America and as soon as it gets dark, it is advisable to stay indoors. We arrived however, in Potosi at 7 30 and it was already pitch black. We needed to get to Sucre and unfortunately had to change taxis and leave the safety of our jeep. We were extremely reluctant to take a taxi as there are so many stories of kidnappings, theft or worse. The taxi terminal was in the darkest, most intimidating, ominous area in Bolivia and we did not feel at all safe. Whilst waiting for the taxi, we witnessed a mugging right in front of our eyes. At this moment, in this dangerous place, I have never felt so scared. Our taxi arrived soon after and throughout the 2 and a half hours that we were in the drivers hands, we were on edge praying to be taken to our hostel in Sucre. 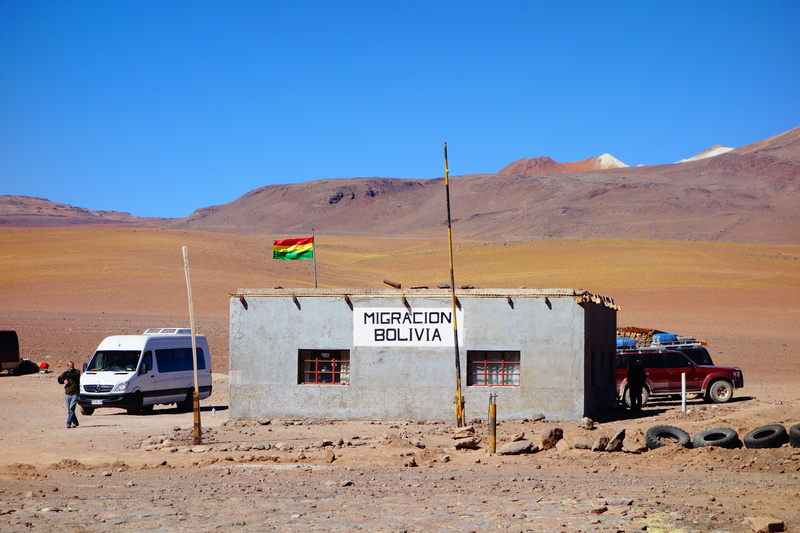 After being stopped by the corrupt Bolivian police for speeding we eventually arrived. I have never been so happy to check-in to a hostel.